Binoculars are optical gears meant to capture breathtaking views while observing the finest of details of a subject and focusing on distant objects to bring them as close to you as possible. They are made of two small telescopes attached side by side to provide you with a close-up of things far away. The compact design of binoculars makes them portable for you to carry around while traveling or taking part in outdoor activities. Binoculars are ideal for bird watching, wildlife viewing, nature observation, hiking, hunting, stargazing, and even sports viewing. This article aims to review the best 10×42 binoculars and provide you with important information before you buy a pair of 10×42 binoculars. 10×42 is the optical configuration of a pair of binoculars. The two numbers represent two separate performance measures. The first number is the magnification power and the second refers is the objective lens diameter. This means that in a 10×42 binocular, ten refers to 10 times magnification power i.e. the binoculars can make the image appear ten times larger than its actual size. The second number 42 refers to the diameter of an objective lens which is an essential parameter in determining the amount of light that is allowed to pass through the lens and enter your eyes. The 10×42 configuration of a binocular is sometimes considered to be the universal configuration because it is practical and adequate for all types of situations. There are certain concepts that act as the factors which you need to consider before choosing the best 10×42 binoculars for your conditions. Magnification power of a binocular decides the extent to which an image can be zoomed or magnified by it. Higher magnification means that you can focus on distant objects more clearly. But the level of magnification achieved by a pair of binoculars can affect its light gathering and retention capabilities. This means the more the magnification, the less is the brightness of the image. Therefore, you need to maintain a balance between magnification and brightness. The objective lens diameter or width determines the light transmission and retention rates of a pair of binoculars. The greater the size of the objective lens, the wider will be the field of view. The brightness also increases with the increase in field of view. This will eventually increase the overall brightness and clarity of the image. One yearns for a crystal clear image when using any optical gear. The optical clarity and quality of the images produced by a pair of binoculars are among the most important factors you’ll have to consider before purchasing them. If a pair of binoculars possesses the ability to make you feel that you are viewing the object in real without an aide then, such a binocular is a must have. On any kind of outdoor excursions, there is a high chance that you encounter a situation where you wish to capture stunning visuals in low light conditions. This may not be possible with binoculars that cannot perform well in poor lighting and you will eventually be left abandoned in capturing some of the rarest moments you will ever see. Make sure to buy binoculars that allow you to observe and focus on subjects even in poorly lit surroundings and have the ability to magnify not only the image but the brightness as well. The overall optical quality is a very crucial factor that you need to consider before deciding on a pair of binoculars. One needs to ensure that the binoculars employ lenses made out of best quality glass if they wish to observe breathtaking views. 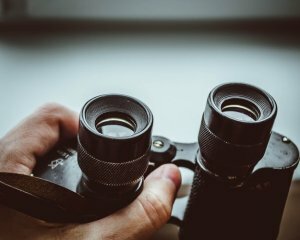 The optical quality of a component used in a binocular refers to the clarity of glass used and how well the surface of the lens has been polished. Better optical quality ensures a reduced amount of reflection or dispersion of light. A lens must have an appropriate coating to enhance its performance. It is very important to have your lens coated properly to get rid of its irregularities and protect it from dust and scratches. This will help prevent the diffraction, distortion and spreading of light. Also, another kind of coating known as an anti-reflective coating may be used to reduce the reflection of the lens surface. A lens coating also tends to smoothen the surface of the lens and make it easier to clean. Exit pupil is simply a window which allows the light to enter and pass through the binoculars. Just like we have pupils to allow the light to enter our eyes, binoculars possess pupils too. The larger the size of the exit pupil, the more light is allowed to pass through the binoculars. This results in a much brighter view. The area of vision which a pair of binoculars can provide at 1000 yards with utmost clarity is defined to be the Field of view of the binocular. For example, a field of view of 329 feet means you will be able to clearly see an area of 329 feet, a 1000 yards away from you. Close focus refers to the amount of focus you can achieve on an object using a pair of binoculars. It depends not only on the binocular but also on the viewer’s eye and focusing ability. There are two main categories of prisms used in binoculars: Porro prism and Roof prism. Among these, the Roof prism is considered to be of great use. It is lightweight and slim in design and dimensions, as it is in a direct line with the eyepiece. And the best part is its reflecting power is which can reflect the transmitted light five times. Speaking of the Porro prism, it requires a larger body to assist itself with the reflection of light. The biggest drawback of this prism is that it isn’t placed in direct alignment with the eyepiece, due to which the actual position of the object gets misplaced. Porro prism binoculars are only recommended for people on a tight budget. This is a very crucial element of a binocular, especially for those who wear glasses. Eye relief is the distance at which you can hold the binocular from your eye and still be able to see a clear-cut picture. It is recommended that people with glasses should opt for binoculars with an eye relief of 14 to 15 mm. It is pretty essential for a pair of binoculars to be waterproof, fog proof and dust proof since they are categorized as outdoor gear. This will allow you to continue using binoculars even under the harshest weather conditions and still observe your target. Here are the best 10×42 binoculars falling into various price ranges. 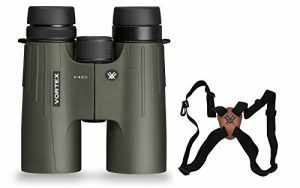 Vortex Optics Viper HD 10×42 is the latest binocular launched by Vortex. The binocular has a magnification of 10x and objective lens of 42 mm, thus giving it a simple and handy feel. It is a handy binocular with good clarity and image quality. These are lightweight binoculars, weighing just 24.6 ounces. The box includes a rain guard eyepiece cover, neck strap, deluxe padded carry case and covers for the objective lenses. This binocular employs a roof prism giving it a compact size and is also equipped with waterproof O-ring seals that act as a great barrier to moisture and dust. The addition of fog proof lenses helps in the survival of the binocular in all kinds of temperatures. This binocular is covered with rubber armor for external protection and shock resistance. The ArmorTek feature gives the body a nice, ultra-hard, scratch free coating thus protecting it from oil and dirt. Leica Geovid HD-B Rangefinding Binoculars have a magnification of 10x and an objective lens of 42 mm. 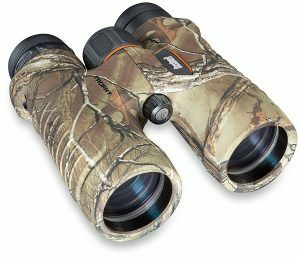 These binoculars use a waterproof and fog proof glass that is best suited for hunting, shooting, golf, and rifle hunting purposes. Also, these binoculars have an automatic adjustment system which equips itself to change according to the lighting conditions. 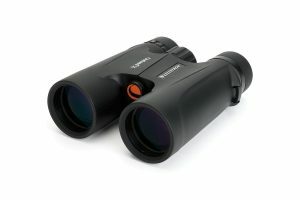 Speaking of the basic physical features, the binoculars are a little on the heavier side (34 oz) and are slightly bulky. This pair of binoculars also possesses a Rangefinder body design and are completely submersible making them ideal for use in rugged terrains and harsh weather conditions. It also provides ballistic functions which can be customized. These binoculars provide great optical configuration and exceptional results but are a little too overpriced. 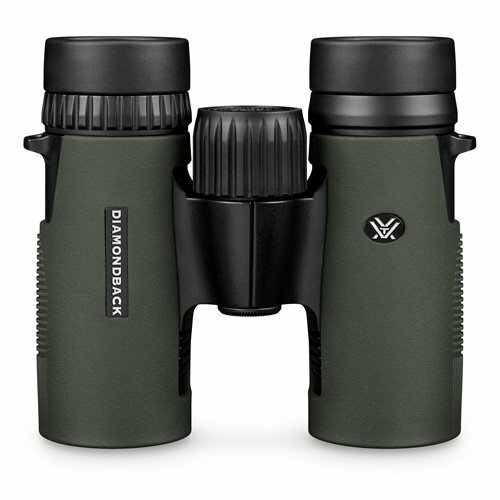 Vortex Optics Diamondback binoculars have a magnification of 10× and an objective length of 42 mm and are thus a standard for people who are into hunting. These binoculars are considered to be a great option for eyeglass wearers as its eye relief feature is perfectly configured at 15 mm. Also, this binocular is one of the lightest binoculars (21.4 oz) made exclusively for adventurers. The lightweight makes them quite portable and a great travel companion for all your outdoor excursions. This pair of binoculars gives you the desired optical performance and remains unmatched in its category. Additionally, these binoculars are installed with multiple coated lenses which help in getting the best of views, even in low light conditions. The linear field of view is 330 feet/1000 yards enabling one to see ultra-wide and best-in-class views. The binoculars are completely fog proof and waterproof which makes them all the more ideal for your outdoor adventures since they won’t hinder your experience regardless of the weather conditions. Also, the rubber armor creates a shockproof covering for these binoculars making them ideal for rugged use. Other significant features include tripod adaptability, adjustable eye caps, center focus wheel, dielectric coating, etc. 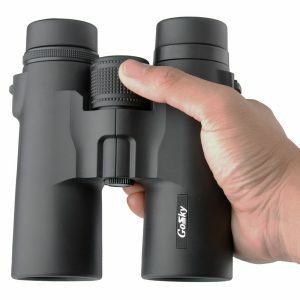 Gosky 10×42 Binoculars are a great pair of binoculars that employ a compact roof prism design for superior optical quality. These binoculars achieve a field of view of approximately 307 feet/1000 yard. These binoculars work great for outdoor activities like hiking, camping, hunting, wildlife observation, bird watching and more. This pair of binoculars comes with a good quality objective lens of 42 mm which is covered with a fully multi-layer coating. It also has an 18 mm blue film eyepiece which ensures brighter, crisper, and clearer views. These binoculars can withstand any temperature and weather condition with the help of its rubber armor, which also helps in improving its shock resistance. The package comes with a carrying case, lens protection and eyepiece covers, neck strap, and a cleaning cloth. This binocular has a major advantage of being compatible with smartphones. It comes with Gosky 2017, which is a smartphone mount and can be connected to a majority of the mobile phones. The Gosky binoculars can definitely be considered as a great pair of binoculars with optimum optical performance. Simmons ProSport is a 10×42 binocular with a roof prism design which helps you view far away places with ease. It comes with multi-coated optics along with dielectric coated BAK-4 prisms which tend to enhance the sharpness, contrast, brightness, and clarity of the image. These binoculars are the most well-known waterproof binoculars with a great exterior design, making them ideal for rough use. They work really well for people with glasses as the eye relief feature is 16 mm which is quite extraordinary. In addition to this, it comes with purged nitrogen for ensuring the waterproof feature and rubber armor coating for an increased grip. 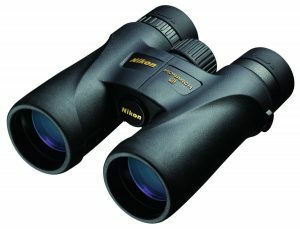 Nikon 7577 Monarch 5 is a 10×42 binocular with an ED (Extra-low Dispersion) glass. It consists of fully multi-coated optics along with a Roof prism design for enhanced clarity and sharpness of the image. Even though the price of this binocular is on the higher side when compared to its counterparts, hunters and adventurers still opt for it due to its high-end features. The best feature of these binoculars is its highpoint design which has an ultimate brow and eye cup front. 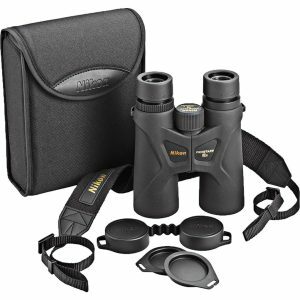 The high-quality glass, tripod adaptability, weatherproofing and quality coating on these binoculars add to its charm. But the relatively high price reduces its popularity. 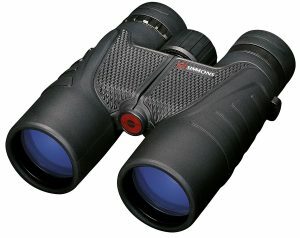 Celestron X 10×42 Binocular is a binocular which works great in all kinds of environments. The excellent lenses have been designed to provide the best of magnification and color coordination. These binoculars have a significant advantage of being submersion proof, which means that they can even be used underwater and wouldn’t erode with the sea water and air. This pair of binoculars is very convenient for sports spectators. 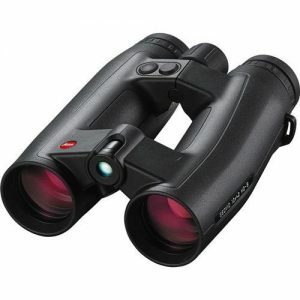 These binoculars are extremely lightweight and have the ability to provide a crystal clear image. On the other hand, this pair of binoculars isn’t as good in low light conditions and doesn’t do wonders at night. Nikon Prostaff 3S is one of the best pairs of binoculars produced by Nikon with a silver-alloy coated roof prism design and an anti-reflection multi-coated optic system. These features ensure that the visuals are bright, clear and of true colors. Its light gathering capability is considered greatly beneficial as it provides a much wider view. 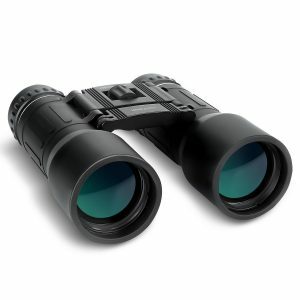 These binoculars are ideal for bird watching, wildlife observation, hunting, hiking, etc. This binocular doesn’t let you miss out on anything and lets you focus easily on your target object due to its 63˚ wide apparent angle of view. These binoculars can be considered lightweight due to their overall weight of just 1.75 lbs. Bushnell makes the best binoculars for hunting at long ranges. These binoculars come with multi-coated lenses which facilitate the transmission of a maximum amount of light. They also have an optimum eye relief feature which has a 2 step twist-up adjustment procedure for convenience. These binoculars also possess a focus knob in the center which can be used to adjust the focus whenever necessary. Apart from this, these binoculars are covered with a non-slippery rubberized armor which provides ultimate grip and eliminates moisture and unwanted shocks. Also, this pair of binoculars is waterproof as well as fog proof which makes it ideal for use in all kinds of harsh weather conditions. Other valuable features include a flip-up cover and adjustable knobs for more manual usage. 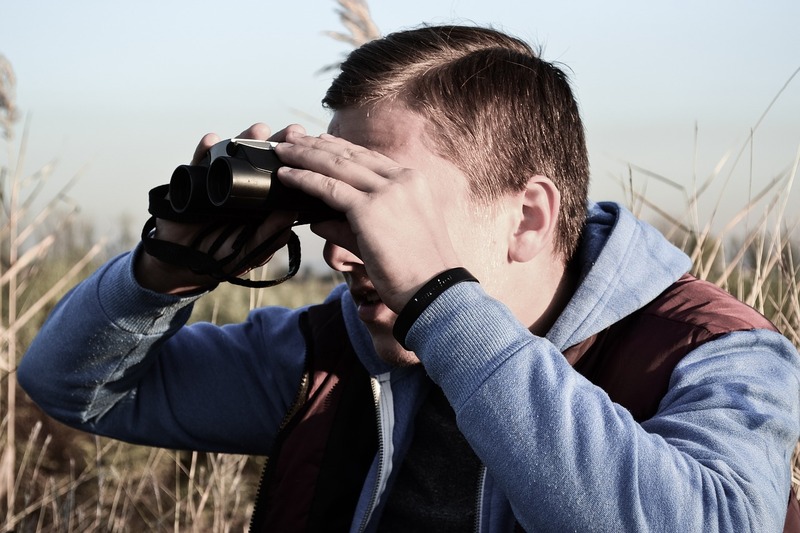 APEMAN Binoculars are the best binoculars for hunting, bird watching, hiking, camping, wildlife observation, sports viewing, etc., if you are looking for something which is cost-effective and efficient at the same time. These binoculars have a magnification of 10x and an objective lens of 42 mm which is one of the most standard optical configurations for an average binocular. Also, they use a pure BAK-7 optical lens which serves the purpose of keeping the visuals clear and bright even in low light conditions. This pair of binoculars is portable due to its light weight (1.18 pounds) and has a compact design. It comes with a strap feature which makes it convenient for traveling and can be a great travel companion. This is a versatile binocular which works well for fishing, hunting, camping, football safaris, concerts and more. Now that you are aware of all the factors that you need to look for in a 10×42 binocular and have read about some of the most popular 10×42 binoculars as well, you are well equipped to pick the best pair of 10×42 binoculars which are suitable for your purpose. It is extremely important for you to go in for a self-research before grabbing hold of any binocular. After all, no one understands your needs better than yourself.